Crescent Valley seniors Andrew McGhee and Elsa Moreno Rangel shared their enthusiasm for Career and Technical Education (CTE) before an audience of 350 at this year’s Foundation benefit breakfast. 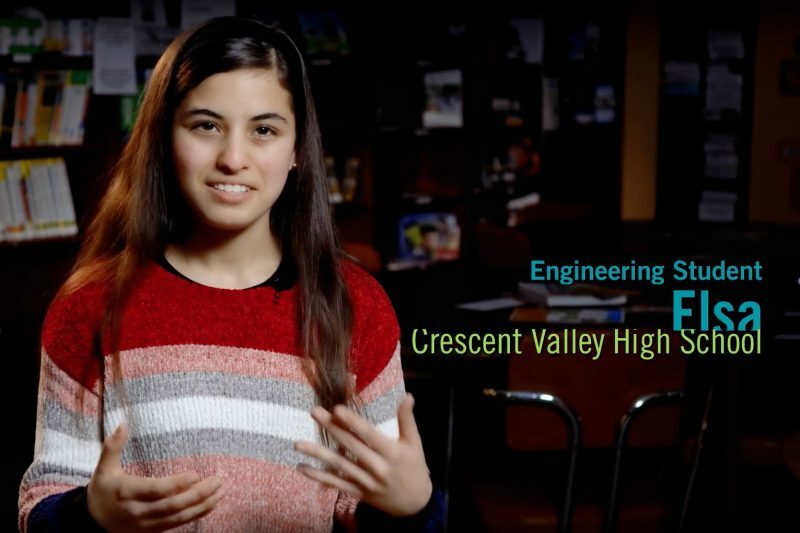 “I remember walking into the classroom and the first thing I saw were… engineering projects hanging from all over the ceiling, and on top of every shelf,” recalled Elsa, adding that engineering classes helped her overcome her shyness. Other 509J students helped make the event memorable, especially Avery Hsieh, Alicia Cheng, Lucy Bloomer, and Adrian Hsieh of Corvallis High School who performed as a string quartet; Corvallis High School Leadership students who assisted with breakfast; and Linus Pauling Middle School art students who contributed centerpieces to the tables.The event, held on January 31 at Corvallis High School, garnered support for the mission of the Corvallis Public Schools Foundation to support local schools and inspire learning for a lifetime. Sponsors included title sponsor Barker-Uerlings Insurance; grand sponsors Benton County Schools Credit Union, Corvallis Kids Pediatric Dentistry, Corvallis Radiology, Jacobs Engineering, North Point Dental, Ollerenshaw Wealth Management, Oregon State Credit Union, and Subaru of Corvallis; honor sponsors Citizens Bank, Devco Engineering, Gerding Companies, Les Schwab, Pacific Power, Samaritan Health Services, The Barbers, and Wilson Motors; and in-kind sponsors Special Occasions and Horsepower Productions.